Back when my husband and I started to have children, a dear friend began giving us beautiful Christmas village houses every year to collect and someday pass on to our children. Every year, as we unpacked the village, one building at a time, we would imagine what it would be like in a place like it. We would place the china characters carefully, connect the cobblestone paths, and talk about what the crunch of the snow sounded like on Christmas Eve. When it was set up perfectly, we would turn out the lights and the amber glow would pour from the windows and lanterns casting an ethereal radiance befitting the holiday season. Some years later, we made the decision to travel around Italy for a while, while applying for our Italian citizenship. Unfortunately, there was no room for the Christmas village in our suitcases. We decided we’d have to come up with some new traditions while we were away. They were right—it looked just like our model town. We were so excited as we explored Cortona and found our favorite Christmas Village businesses: the butcher, the baker, and the candlestick maker were all present and accounted for! Cortona is astonishing. It is bathed in fiery Tuscan light and rooted generations of Italian families with a generous mix of monks, students, and expats to keep things bustling. There are famous works of art in very accessible museums and piazzas that pulse with life, rain or shine. And the beauty of Cortona is literally the stuff of movies—both Life is Beautiful and Under the Tuscan Sun were filmed here. Cortona is effortlessly elegant. You’ll find beautiful and perfectly presented shops without any pretentiousness here. They celebrate Christmas with the same elegance, too. You won’t hear Christmas carols the day after Halloween here, Instead, on December 8th, the Feast of the Immaculate Conception, the shopkeepers paper the windows, and by dusk their holiday decorating prowess is revealed…and the winding cobblestoned streets are draped exquisitely with white lights. 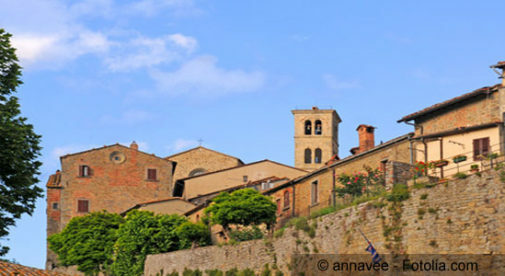 If you celebrate Christmas, you’ll find plenty of places to do it in Cortona. Even if you don’t, the history and beauty of the churches here are worth visiting. So far, we’ve been in 13 churches in Cortona. Some of them have ancient foundations from pagan temples that support awe-inspiring examples of Renaissance or Byzantine architecture. Although the architecture varies dramatically, there is one constant when we stand before these many churches. When we are lucky enough to be near a church as the bells begin to swing, we can hear them rocking in an ancient dance and they prepare to sing. For just a moment, after the bell tolls, the rocking can be heard again, until stillness prevails. And in this season, you won’t just faintly hear the muffled sound of Notte silenziosa, notte santa (“Silent night, holy night”) through closed cafe doors…you can feel the essence of the song as you brave the December wind to walk on these perfect ancient streets. As our footsteps crunch along a pea gravel path and we watch the sunset over the Tuscan hills, we know we have imagined our way right inside our own piccolo villaggio di natale (little Christmas village).